In memory and recognition of the recent passing of Dilys Winn, I’m doing this as my Friday Forgotten Book. There is more than one kind of reference book. There is the kind that is comprised of page after page of small print giving vast amounts of information in detail about the subject under consideration, and then there is the other kind. Murder Ink is one of those other kind. Herein you’ll find collections of articles and essays covering a range of topically related subjects, often including illustrations, humor, insights, history, lists and surprises. I like this kind of reference book – a lot. This is the kind of thing you can sit and browse by the hour. I’d been a mystery fan for many years before it occurred to me to invest my book money in a reference book, and when I did it was Hubin’s two volume set. But this book wasn’t far behind, and this one is both informative and enjoyable. The original Murder Ink opened in 1972 on West 87th Street in Manhattan as perhaps the first bookstore devoted to crime and detective fiction. Its founder, Dilys Winn, sold the store after three years to Carol Brener, who owned it for 14 years. The store stayed at that address for 34 years, a beacon to mystery readers worldwide, and many other mystery specialty bookstores opened in it’s wake. 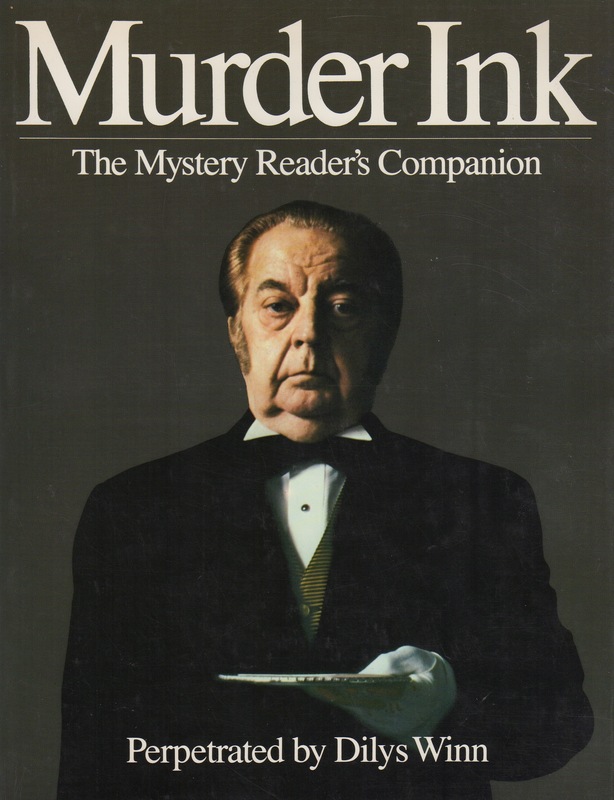 Meanwhile Winn was busy writing essays and articles about mystery fiction and decided to put together a book devoted to the subject which became this book, Murder Ink. As you can see from the back cover and also the first page of the table of contents, there is a lot of fascinating information between the covers. It had been a while since I had this off the shelf, and I’m afraid it will be a while before I put it back, as a quick skim through seems impossible. My nose will be glued to Murder Ink for several days, or more. 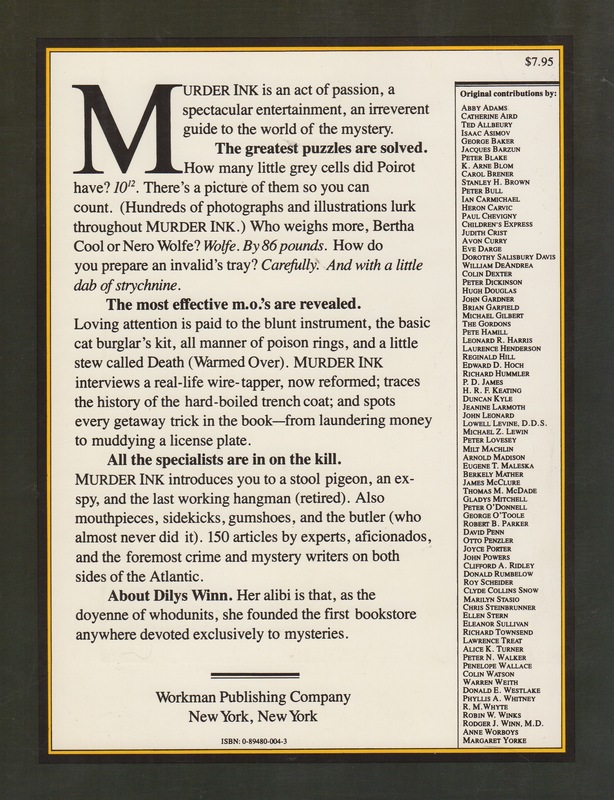 The Mystery Writers of America conferred a Special Edgar Allan Poe Award on Murder Ink in 1978. A sequel, Murderess Ink: The Better Half of the Mystery, followed in 1979. There was a second edition published in 1984 with the same contents plus some additions including a short story spread out over the many chapter headings. Winn was a wonderful person (I met her briefly at a Bouchercon in, I believe, either Seattle or Milwaukee and she was very nice) and a staunch supporter of the genre. This book should be on every mystery reader’s book shelf! Very Highly Recommended. Excellent pick and I second your concluding remarks. I was just reading about Murderess Ink recently. I want copies of both of them. I did have them long ago but don’t know where they are now. Tracy, dig them out and browse! Or get new/old copies, they’re out there. Did you both the price on the scan of the back? $7.95. Seems really cheap now, but wasn’t then. I have a big red hardback copy of this at home and regularly dip in – a great tribute Richard. I didn’t remember there was a hardcover edition. Mine says first edition, first printing. Must be for the soft cover edition. I loved this book when it was first published. Excellent choice! It’s fun to read through it again, George. Stupid thing just ate my comment. It must have been cool to go there, especially in the early days of the store. 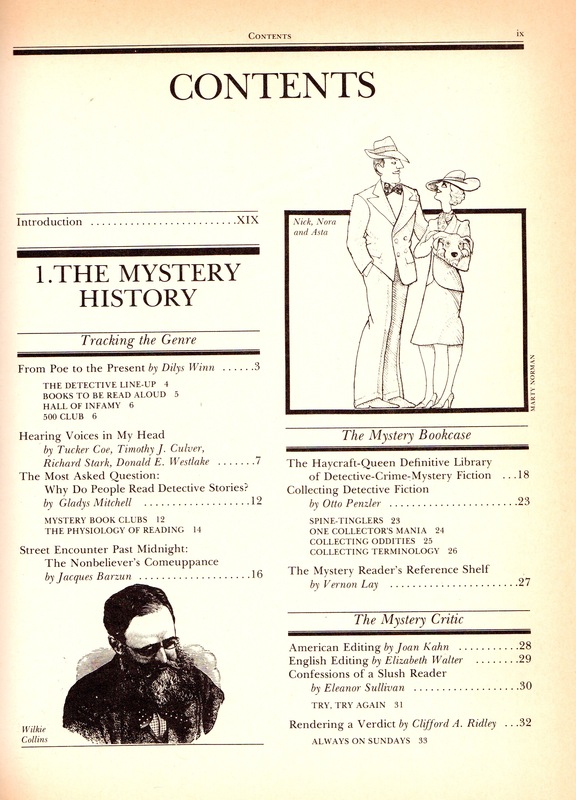 There was a great mystery specialty book store in Sherman Oaks, CA.It was a long way to drive, but my first introduction to mystery focused seller.That was THE SCENE OF THE CRIME owned by Ruth Windfeldt. I went three or four times a year, always came home with a big bag of goodness. We went to Scene of the Crime too. There is still a mystery bookstore in Delray Beach, but we haven’t been there in years. We have been to The Poisoned Pen in Scottsdale. I’ve been to Poisoned Pen, and also used to get their catalog and mail order from them There was a really nice guy who did the mail orders, Tom, I think, who got to know what I was interested in and would shoot me a note (bu snail mail!) to alert me to new things coming. You don’t get that from B&N. A lot of the clerks in B&N haven’t heard of the authors, let alone know if they have the book on the shelf. I’ve had pieces in a couple of these kinds of books. I like them too. Lots of different food for thought. And food for memories, too! Got this as a Christmas present in 1977 from my friends in high school. One of the best gifts I ever received. I devoured it for months and it was largely responsible for my current mystery book collection mania. Murder Ink was where I learned about Dell mapbacks, the rare books of the Victorian era, and was introduced to many writers who I read for the first time because of an essay or some other mention in that book. It was well thumbed and the binding broke in several places within a year from my near daily poring over its pages. The first time I set foot in the bookstore Murder Ink sometime in the 1980s was very memorable for me. Thereafter it was a required stop anytime we went to NYC. I used to have one of the gun shaped bookmarks they gave out with any purchase. I was rather depressed when I learned it was closing back in 2006. That’s a great story, John, thanks for sharing it. Though I’ve read mine through more than once, I tried to be really gentle with it, so it’s in good shape except for the browning at the edges. I was delighted with it when I first read it, but I knew much less about mystery genre then. For instance, I’m not nearly as impressed with the Haycroft-Queen list now as I was then. I was really sad to read of the store’s closure, though I’d never been there, even more saddened when Scene of the Crime, in So Cal, moved, then changed hands (and started carrying a lot of other books and various knickknacks and junk). But then there have been so many mystery bookstores close in the last decade and a half. Love this book. I still dip into it and MURDERESS INK every so often. Unlike thee and me, this book never seems to get old! I wish I was in good shape as my copy of this book, which I scanned for this post. I’m enjoying going through it again, though I now think I’ll not read every article. I should have remembered – the Delray Beach mystery bookstore is Murder on t the Beach. It’s not dissimilar in looks to Poisoned Pen, at least when I was last there. Nice tribute. A fun book. But it’s Hubin with an “i”, please. I used to have both but now seem to only have Murderess Ink. Perhaps I was feeling misanthropic one day. You? How could that be? Must have been a case of borrowed-not-returned. I have the Murder Ink bookmark within reach as I type this. The only time I saw Dilys was on a Tomorrow show with several mystery writers–Mickey Spillane was one of them–and she acted kind of goofy. I’m glad to know she was normal in person.